We at The Expeditioner know you’ve heard about the sights, nightlife and legendary attitude of New York a million times. So we’re going to focus on something just as important: the food. And hopefully we’ll introduce you to a few New York landmarks you’ve never heard of. Now, we know what you’re thinking, it must have taken ages (not to mention lots of money) for us to run all over town sampling New York’s finest eats. Well, not that we wouldn’t do that for our dear readers. But, luckily for us, we didn’t have to. 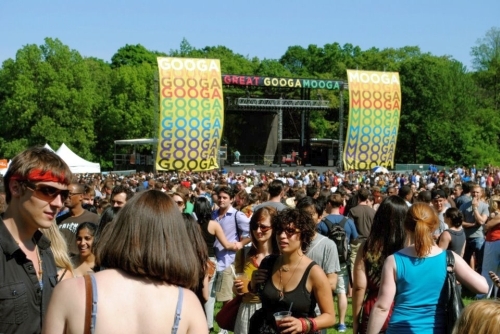 This summer, chefs from some of the tastiest restaurants across the five boroughs gathered in Prospect Park, Brooklyn, for The Great Googa Mooga, a two-day food and music extravaganza. I and my trusty photographer were on hand both days to brave the extreme temperatures, four-hour lines and disturbing lack of water to bring you a list of some of the best places to eat here in New York. You’re welcome. Here were some of our favorites from the festival and where you can find them around the city. First things first. Before we go telling you where to go to stuff yourself until you can’t see straight (and don’t worry, we’ll get to that), here are a few places with delectable small bites. After all, slow and steady wins the race. The Greeks are great at a lot of things, such as creating democracy, pontificating about philosophy and festively breaking dishes. But, if there’s one thing the Greeks are really great at, it’s cooking. We New Yorkers are extremely proud of the fact that you can find any type of cuisine in our fair city, and that it will taste as good as it would in its home country. 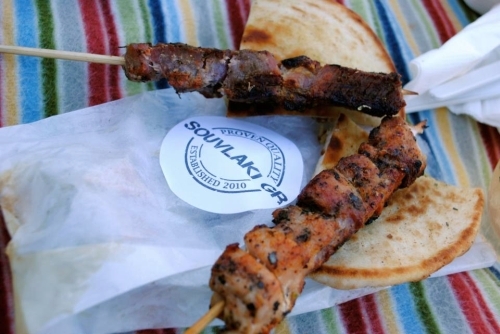 So, when I tell you that you don’t need to go to Greece to get amazing souvlaki, I speak the truth. The namesake of this Lower East Side eatery, available in pork and chicken, is juicy, tender, tasty and, best of all, portable, since it comes on a stick. Craving more than just meat? We recommend the Greek fries, which are hand-cut and sprinkled with Feta cheese. 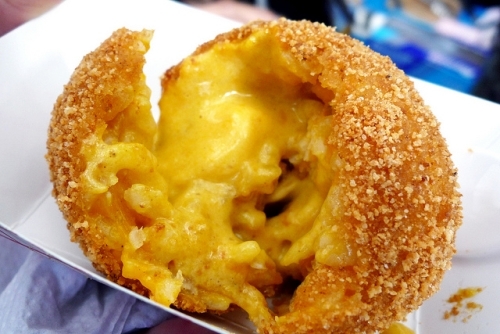 The Arancini Bros. are famous for one thing and one thing only: balls. Rice balls, that is. Arancini is actually the Italian word for these deep-fried wonders. So, unfortunately, you won’t find any picturesquely mustachioed members of the Arancini family at this Brooklyn-based establishment. Or any brothers, so far as we know. But you will find over 20 types of rice balls, both sweet and savory. Some of our favorites include the Lobster, Three Cheese, Strawberry Mascarpone and Nutella. And, no, we didn’t try them all in one sitting. Okay, yes we did. Don’t judge us. It is a truth universally acknowledged that almost everything tastes better between two slices of bread. So, fittingly, the next few stops on our food tour feature the kind of delectable sandwiches that lunchboxes all over the nation dream about at night. Just down the block from Souvlaki GR, you’ll find Little Muenster, a specialty restaurant whose tagline is “Super Fancy Grilled Cheese.” We couldn’t have put it better ourselves. At The Great Googa Mooga, we waited two-and-a-half hours for our sandwich from Little Muenster. Actually, in the interest of full disclosure, I waited two-and-a-half hours for our sandwich. My trusty photographer sidekick was on the beer line (for an equally long time, I might add). Anyway, during the wait, all I kept thinking was, “There is no way this sandwich is going to be worth all this suffering.” But, for the sake of the faithful Expeditioner readers, I stuck it out. Finally, I got to the front, ordered our sandwich: a blend of Oaxaca and Cotija cheeses with corn puree, jalapeño and tomatillo, and hunted down my sidekick and our brews. After that, I ate my words. Literally. This sandwich was so good that, if there had been enough hours in the day, I would have gotten back on line for a second one. And then a third. The organic bread was crunchy and buttery. The cheese was creamy and gooey. The corn puree, jalapeño and tomatillos were flavorful and spicy. 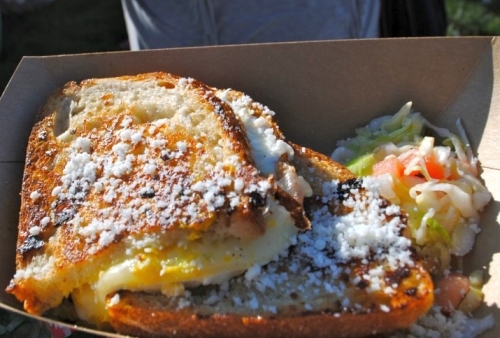 Little Muenster is all about comfort food to the umpteenth degree. At the restaurant, you’ll find seven more grilled cheese varieties, from the classic (White American and Bacon) to the upscale (Asiago, Parmesan, Butternut Squash and Sage Brown Butter) as well as Tomato Soup for dipping. 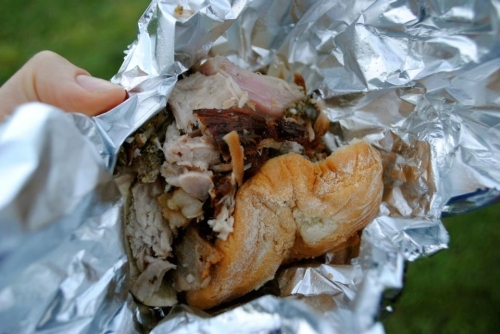 There was one food stand that my partner insisted we try: Porchetta. This East Village spot has a simplistic approach to food. They marinate the pork in a variety of herbs and spices, cook it slowly at a low temperature, slice it, slap it on a thick bun and blow your mind with it. The meat is tender and melt-in-your-mouth good, the bread is soft and tasty, and the combo is filling enough to make the hungriest carnivore roar with delight. Porchetta’s menu is a bit small, as it’s basically just the sandwich, a soup, a salad and some sides, but with a namesake this good, what more do you need? One of the most storied sandwiches in New York is the pastrami on rye. You’ll find it nearly any place sandwiches are made. However, if you’re going to do it right, you’ve got to get one from a kosher deli. Kutsher’s Tribeca, an upscale Jewish American restaurant, is a bit pricey, but absolutely worth it. Their house-cured pastrami is tender, smoky, peppery and tastes divine on rye bread, with or without mustard. Kutsher’s also serves up a variety of other kosher favorites, including Reuben sandwiches, Mrs. Kutsher’s matzo ball soup and bagels with shmear. Don’t forget to eat your pickles! In case you didn’t know, this Harlem-based soul food joint from famed chef Marcus Samuelsson is very popular. So popular, in fact, that it often takes weeks to get a reservation. We were able to cut down on this time (slightly) by waiting in line here. However, those in-the-know are privy to the fact that you can skip the lines and reservations by sitting at the restaurant’s bar. Shhhh, don’t tell anyone else! The Red Rooster booth here — which was manned by Samuelsson himself — served up Berbere roasted chicken with barbecue sauce. Though they sold like the proverbial hotcakes, we were able to get our hands on a plate, and it was life-changing. 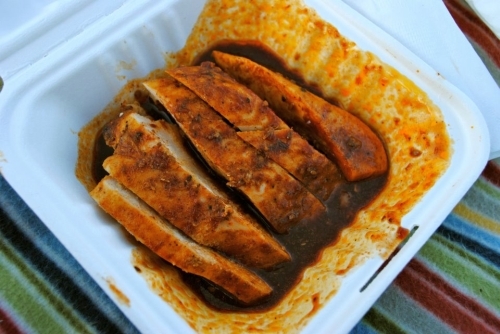 The only way to describe it would be to say that it was everything you would ever want in a chicken and barbecue sauce dish: perfectly seasoned chicken; sweet, sugary sauce; and ooey, gooey messiness. The kind of meal where half is left on your face and fingers after you’re finished. And, let’s face it, you wouldn’t have it any other way. Uptown at the actual restaurant, you’ll find a menu chock-full of other soul food faves like corn bread, grits and collard greens. An Izakaya is a Japanese restaurant/bar popular among businesspeople for the Far East version of Happy Hour. At Kasadela Izakaya, you’ll find the atmosphere and, thankfully, the menu of a Tokyo sake den in Manhattan’s East Village. Best of all, everything on the menu is reasonably priced, so you can try a few different dishes (or sakes) without breaking the bank. 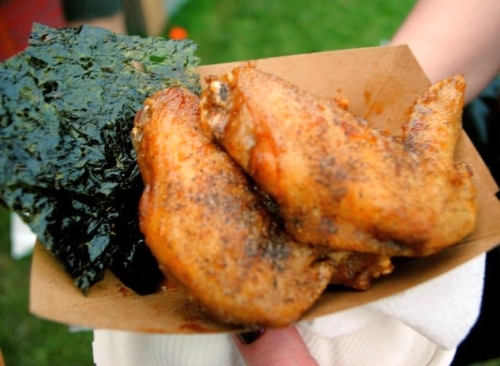 We recommend the Tebasaki, which are Japanese-style chicken wings. The wings are double-fried without batter or breadcrumbs and coated in soy sauce, black pepper and garlic, resulting in a dish so juicy, spicy and finger-licking good, it’s nearly indescribable. Looking for some small bites to go along with your sake? Try the Nori, which is roasted seaweed. We were a bit scared of it at first, thinking it would look (and taste) like the kind of seaweed you see floating past your legs at nearby Rockaway Beach. But it was warm, crunchy, salty and melted in your mouth, like a healthier version of potato chips. By the time we got to dessert at Googa Mooga, we were tired, hot, stuffed and wanted nothing more than to go home and rest. Until we heard what was available, that is. Three words: birthday, cake and truffles. These were the hands-down best things we ate over our entire two-day stint at Googa Mooga. They were so good, in fact, that I’ve been back to Momofuku twice since, even though it’s totally out of my way when I’m commuting home from work. 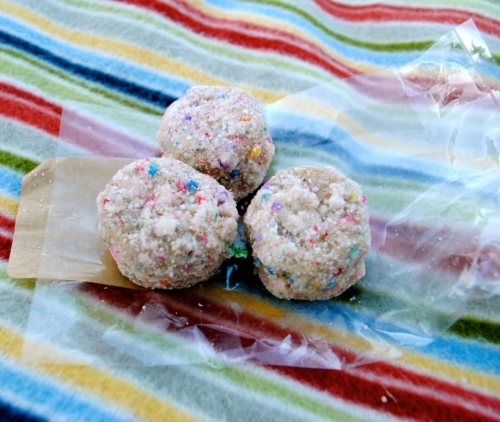 Imagine a ball of cake batter mixed with sprinkles, covered in powdered sugar and ready to eat (but without the risk of salmonella from eating raw eggs) and you’ll know what it’s like to have a Momofuku Birthday Cake Truffle. At the festival, we bought a pack of three. We each ate one. Then, though they are about the size of a Snapple cap, we cut the third one in half to maximize the amount of truffle we got to eat. They’re that good. Even better, Momofuku has a full menu of sweets, including pies, cookies, ice cream and more truffle flavors. This East Village sweet shop has some of the best homemade ice cream flavors in town, paired with some of the most unique toppings (sea salt and cayenne pepper, really?). BGICS is the kind of place where you look at the menu, think “that can’t be good,” and then get pleasantly surprised. 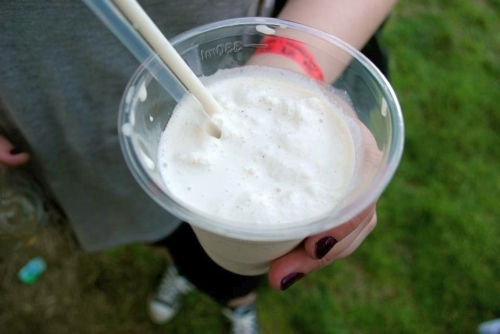 For example, at The Great Googa Mooga, they were serving up Ginger Curry Milkshakes. “That can’t be good,” I thought, picturing the pinkish flakes I always — ahem — gingerly scrape off my sushi with a look of disgust. And then, you guessed it, I was pleasantly surprised. The flavor was there, but sweeter, and light enough that you weren’t overwhelmed by it. Plus, the shake had the perfect level of creaminess and didn’t get watery, despite the heat of the day. At the actual shop, you’ll find a great selection of ice creams and toppings, as well as offerings from such other New York eateries as Melt Bakery, Danny Macaroons and La Newyorkina. But wait, there’s more! The Big Gay Ice Cream Shop is also available in truck form! Check out their official website or Twitter feed to find out where you can catch the Big Gay Ice Cream Truck. There you have it, foodies. Some great places to try in New York City this fall. I don’t know about you, but I am stuffed. Now, if you don’t mind, I’m going to go take a nice, long, carb-filled nap. Happy eating! Cindy Klimek is a Brooklyn, New York, native and recent graduate of the University of Sussex in Brighton, England. She aspires to become a multilingual travel writer/filthy rich jetsetter. Alexis Michalakis is a photographer/foodie/food pic aficionado from Brooklyn, New York. She is currently working on a coffee table book of her work. The girls have been friends since freshman year of high school. This is their first creative collaboration.